Would you like to think like a decorator? We all want our homes to reflect our personalities and suit our lifestyle. Those important elements don’t need to be sacrificed in order to create a home you love with the style you crave. Yes, you can easily think like a decorator with a few key tips and a mindset change. One of my key tips is to try and view the room to be redecorated as belonging to someone else. Sometimes taking a step back and not being so emotionally involved WILL help you to make better interior design decisions. So bear that in mind, observe the tips you need, and save the others for another room. Image courtesy of Branca Inc.
Wen you are working with four walls unless you knock out a wall you’re not going to change the ACTUAL size of the room. However, you can make it LOOK bigger or smaller with some visual tricks. Make low ceilings look higher by installing a vertically striped pattern on the walls. Think paint, wallpaper or wood. This applies to all rooms from wet areas to living and bedrooms. If a room has high ceilings and you’d like it to feel more intimate, use a rich, dark wallpaper with a small pattern, such as paisley. Remove large pieces of furniture or other objects blocking windows. When you allow more natural light into a room you’ll give the impression of space. Use glass and other translucent materials for chairs (such as ghost chairs), dining and coffee tables. When you can ‘see through’ objects the space will appear larger (try Temple & Webster for replica Phillipe Starck ghost chairs). Choose sofas, ottoman, chairs, and dressers with feet. Having furniture raised off the floor will give the impression of more space as there is clearance underneath. Small rooms, such as the toilet or powder room, look dramatic and bigger when you hang highly decorative wallpaper (yes, really). Use mirrors to reflect light and other areas of the room, therefore giving the illusion of being a bigger room. Make windows look bigger by hanging drapes on a track that’s closer to the ceiling than the top of the window. Ensure drapes then fall to the floor even if the window doesn’t. When designing small spaces, simplicity is the key to a great result. Keep things simple with an unfussy colour palette and clean lines in furniture. Add fun additions to any room with motifs, geometrics or a mural with temporary wallpaper. Wall decals now come in many forms and are great for a nursery, children’s bedroom, bathroom or going up stairs. I’ve seen decals that depict kitchen equipment or large clocks that liven up an open plan kitchen. The artwork of Canadian artist Shandra Smith has been made into wallpaper murals with colour and dynamism. Easy to install and they look like a mural. Take tips from Interior Designer and ‘The Block’ Judge Shaynna Blaze with 3 easy paint ideas to decorate a bare wall. Add geometric shapes and fun kid-friendly ideas. Stencils are also a terrific DIY solution for tired or bare walls. let your imagination go wild with these charming wall stencil ideas. Don’t dismiss wallpaper because now the options are endless. Patterned and metallic papers are great for a feature wall without giving that ‘display home’ feel. They are perfect for large walls or difficult spaces such as under the stairs. Wallpapers now are much easier to install so you may be able to DIY. Add a sense of the natural to your home with grass cloth. It’s made from woven grass fibres, which add texture to a sophisticated home. Monochromatic rooms need texture in the form of rugs, throws, cushions, and drapes in textured fabrics. Think knotted wool, faux fur, hide rugs, linen, brocade, sheepskin, etc. Throw sheepskin rugs over the back of several dining chairs for a warm Scandi feel. Use salvaged wood for walls and ceilings to add rustic charm. Old pallets are very popular or salvage wood from a demolished home or sleepers from the rail yard. Want the look of expensive stone but you’re on a budget? Pick key spots only to add impact, not expense. Glass and matte – use glossy stone and tiles on surfaces you don’t use all the time, to minimize dulling. If you have children and pets, you might need tough, stain resistant fabrics that help keep your décor looking fresh. Check out exterior fabrics you can use inside. Choose one of the many new washable paints in thousands of colours that will easily erase the inadvertent art attempts of small children. Teach children from an early age to tidy up by providing easy to access toy boxes and bins. Incorporate storage and activity centres in the design process. 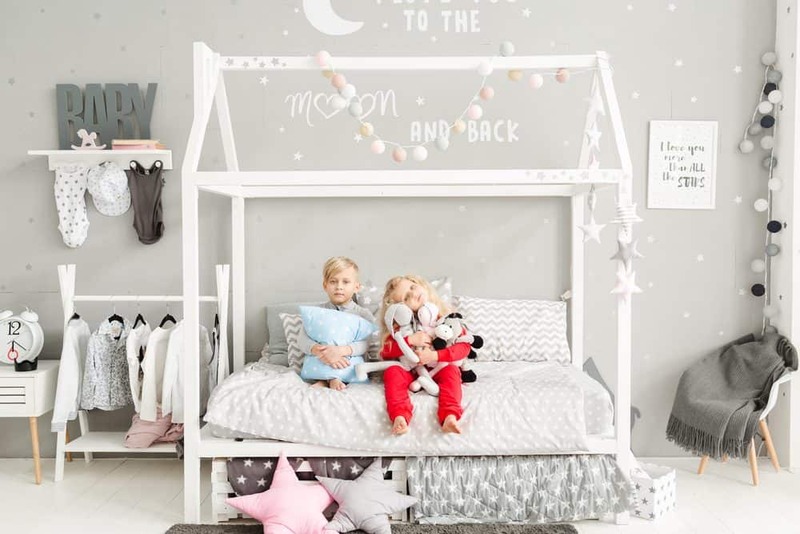 Allow children to be part of the design and colours of their own bedrooms. This will give them a sense of ‘ownership’ and teach them some new skills. Don’t choose strong colours like red or orange as they are too vibrant for a bedroom. Use restful colours and add vibrancy in accessories. Consider washable slip-covers if your child has a sofa or covered chair in their room. This will save you time… and sanity. Give your rooms a luxury feel by taking tiles right up to the ceiling, especially in wet areas. It makes the space look more ‘finished’. Give a co-ordinated look by wrapping fabric around a drum lampshade – highly personal, you can match with other colours and textures in the room. Ensure drapes are well hemmed to fall beautifully to the floor. With lightweight fabrics, sew a few glass stones into the hem to encourage a good drop. If you want to add a rug, choose one that is the correct size for the furniture. The back legs of chairs should NOT fall off the edge of the rug. We now offer Home Styling, decluttering and Adelaide interior designer services to help you love where you live. Use our expert advice on colour consultation, home design, furniture positioning and traffic flow, storage, decluttering, using what you have for a better design outcome, or use our suppliers for unique and new products often SAVING you money. There are lots of great design ideas, interior and exterior, here on Don’t Call Me Penny. Get more inspiration with perfect hanging ideas for art works, outdoor living design ideas, the amazing Coodo portable room solution, and the art of incorporating beautiful fabrics in your home. Please remember, you can keep up-to-date by following me on Facebook, Twitter and Instagram.